Before the time of trains, horses ruled the roads, hauling goods across the country. Alongside these four-legged powerhouses were bullocks and camels by the thousands. While they did get the job done, you can only imagine how long each trip took and how much strain it put not only on the animals but on their human keepers, as well. Deliveries of goods, tools, and other needs took months and with the waiting in between each drop off, supplies often fell short. Fortunately for us today, modern trucks have made it possible not only to transport tones of freight across great distances to remote areas but also, achieving it with reasonable speed and expenditure. To commemorate this huge progress, let’s take a trip down memory lane and see how we got to retire from galloping horses to massive road trains. In 1863, the copper mines in Yudnamutana, South Australia, began employing steam-hauled road trains to transport their hauls across the valley. These steam trains sped up the work that needed to be done but consumed massive amounts of wood. Keeping the steam trains running was labor-intensive and not ecological. By the dawn of the 20th century, steam-powered vehicles started making an appearance elsewhere in the country. Among these are the steam-powered French Chaboche which was brought into the country by Mark Foy in 1902, and the iconic Dennis N-type fire truck which the Dennis brothers built in 1905. In 1907, Felix and Norman Laurie Caldwell patented the technology for the 4×4 –a four-wheel drive system with four-wheel-steering. Just three years later in 1910, they collaborated with Henry Vale and filed yet again another patent, which this time states “Improved power steering gear for heavy motor driven road vehicles“. This patent refers to the 60/80 HP road train that they constructed one year earlier, a train that can pull a gross load of 50 tons. Also in 1920, they created the first tipper truck. 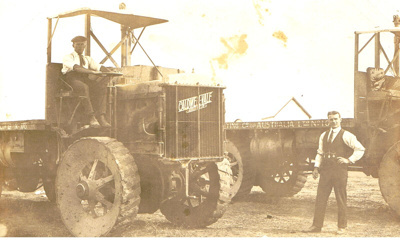 The company, Caldwell Vale, went on to build tractors until 1913 when they had to face court issues with relation to performance guarantees. Operations were turned over to Purcell Engineering in 1916. Internal-combustion engines were introduced in 1912 but trucks were not produced on a large scale until the invention of gasoline engines in 1914. In just 10 years, thousands of vehicles with towing capabilities were manufactured. Despite the boom in the auto industry, much of the work is still shouldered by horses at this point. Nevertheless, all it would take are a few years before the truck revolution begins. The first AC Mack truck is imported to Sydney in 1919. This is a big year in trucks as the Cummins Engine Company was founded in the US. Then in 1923, Kenworth Motor Truck Corporation started its production and their primary goal was to build trucks for loggers. Also in this year, MAN and Benz developed the first diesel truck. With the introduction of heavy-duty trucks, the number of trucks on the road increased by the thousands in the 1920’s, but not without protest from the government first. The States didn’t take into liking the idea of interstate road transport and instead extended the railways hoping this would be enough. As one can imagine, the States couldn’t have been more wrong. The States finally recognised the value of trucking in 1942. During the war, coastal shipping and railway systems have become either short on hand or overloaded to cater to all freight transport needs forcing various states to rely on trucks for city-to-city shipments. Fragile packages benefited the most from this change since truck shipments mean minimal handling. Despite this, long distance transports were still frowned upon and were rare. The resistance to trucks continued in to the 1950’s when the government implemented the Road Maintenance Tax. Many truckers deemed the tax unfair and resorted to underpaying or avoiding it altogether. In addition to the tax, other suffocating restrictions were put into place such as low speed limits, axle-weight limits, and limited driving hours. The most popular trucks during this time are the Mack B-model and the Knocker or Commer TS3. Despite the restrictions, the number of trucks on the roads continued to grow. 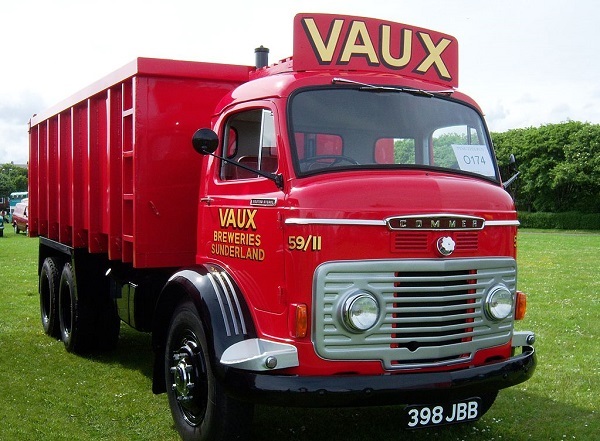 The mid 50’s saw a rise in competition between truck manufacturers. Along with this is the increase in the prices of tyres and fuel. By the late 60’s Volvo and OshKosh has joined the Australian market and in the beginning of the 70’s, Ford entered the game. It was also in the 70’s when trucks’ power reached new height in the form of the Turbocharger which gave trucks a 370 HP engine. In 1970, Kenworth inaugurated its Victoria factory, which produced the first ever Australian-manufactured truck a year later. Subsequently, Kenworth’s K125 was crowned King of the Road –a title that lasted almost a decade until it was overthrown by the Mack Superliner in 1980. Interstate travel still wasn’t well accepted but more and more verbal contracts were being exchanged and honored solely on good faith. 1979 was an important year to truckers. Ted Stevens, along with four others, led the Razorback Mountain Blockade as a protest against the unfair maintenance tax payments. He was later joined by 20,000 more drivers. The protest was deemed a success as it led to the abolition of the maintenance tax. 10 years later, in 1989, the Australian Trucking Association is formed after a long battle against the recommendations of the Interstate Commission Report for more stringent requirements that would have put an end to a lot of trucking businesses. This struggle was the last for the truckers and from then on, regulations have been more or less fair –uniform driving schedules for the eastern states, an increase in speed limit, revised registration fees, and increased tonnage. In the last 30 years, the trucking industry and the magnificent machines it relied upon has come a long way. Interstate trucking has become safer and more cost-efficient for businesses, and driving has become more comfortable allowing the community to grow. Everyday, trucking technology is being refined to meet the demands of the modern world for environmental compliance — a step to ensure that trucking remains a safe, convenient, and economical way to haul freight across the Australia. If you’re in the market for a newer model, talk to the team at Aussie Truck Loans today. Either call us on 1300 769 999 or simply apply online.